One of the things you quickly realize when travelling in Alaska is that there are a lot of white topped mountains and they are not "snow caps”. Most of the white on mountains are glaciers and remnants of glaciers formed thousands of years ago. These mountain-top frozen rivers are moving down towards the sea just as water in a mountain stream flows to the lakes in southern areas. The mountain top lakes are large glaciers some over 1.6 km (1 mile) thick. 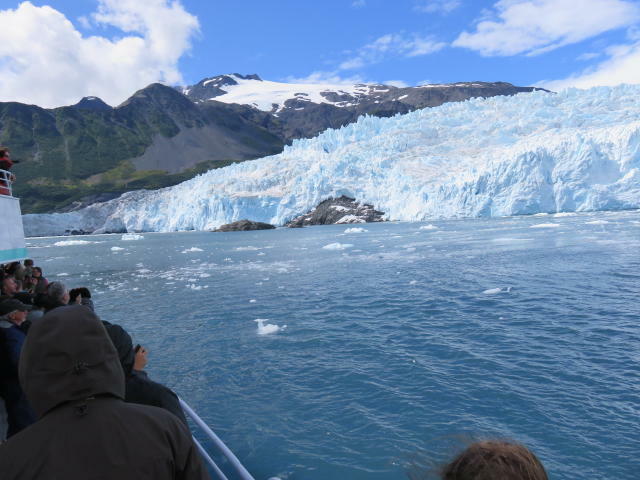 The tour through Kenai Fjord National Park showed us that some are tidewater glaciers which actually touch the ocean. One is the Aialik (pronounced Ayelick) Glacier. 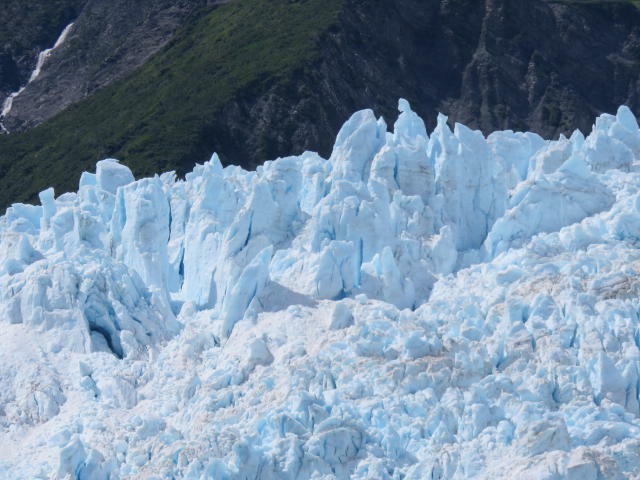 It is fed from the Harding Icefield, the largest ice field contained entirely within the United States. 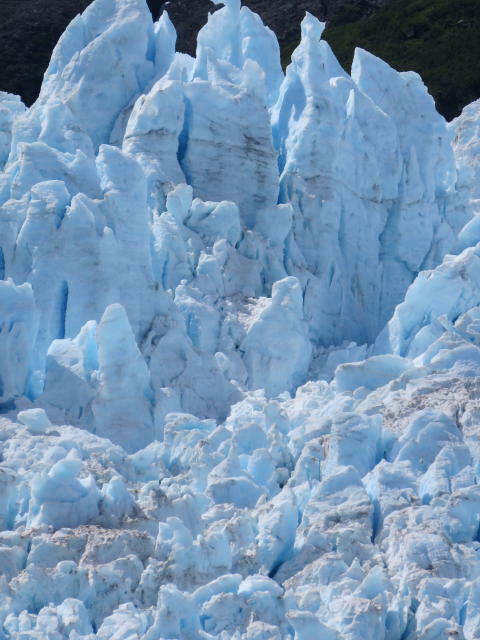 This ice field and its preservation was the reason the Kenai Fjord National Park was established. It is estimated that about 10m to 15m (400 to 600 inches) of snow fall on this ice field each year. 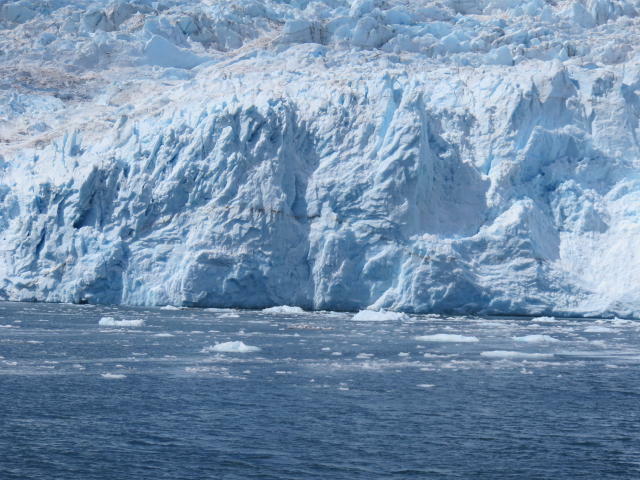 Slide 1 shows one of these tidewater glaciers and Slides 2 & 3 show the Aialik Glacier that we travelled to see. Slide 4 shows the glacier up close and you can see the way the glacier is sectioned and beginning to break up as the heat of the sun combines with the ‘warmth’ of the ocean. As these sections heat up, they calve into the ocean with an incredible noise and splash. They are tall, thick slabs of ice. We were fortunate to see one section calve into the ocean and produce small icebergs that float away. You can see in Slides 5 & 6, the size of the cliffs in the snow. In Slide 7 the cracks are more obvious. Moving away from the glacier you get an idea of how wide it really is 5 Km (3 miles) at the water’s edge (Slide 8). It does not seem that wide, but all perspectives change when you are on the water. Eric was very good in addressing climate change. He said that as the world’s average temperature rises more of the glacier ends up in the ocean and it and all others are retreating back away from the ocean edge, however this cycle has been going on for centuries. Recent yearly snowfall rates are larger than usual which is already replenishing the glaciers. 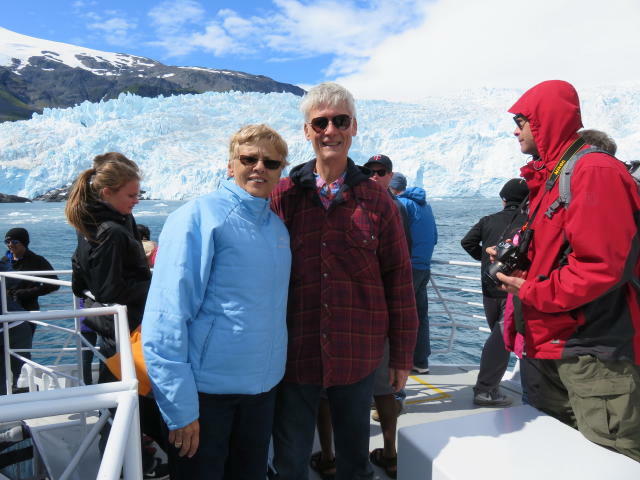 Of course, this trip would not be complete without a picture of us with the Aialik Glacier in the background. Slide 8 fulfills that requirement. We both can say it was COLD up there, the wind cut through the air even though it was a wonderful, sunny day. 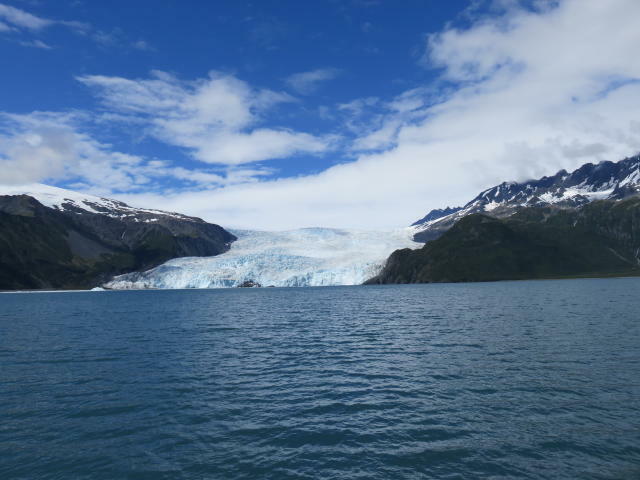 We also learned (and recalled) that when Glaciers make their way down to the sea, they grind away the sides of the mountains and leave a wide, round bottomed valley whereas, when a river of water flows down a mountain, the river cuts a deep, V-shaped channel. 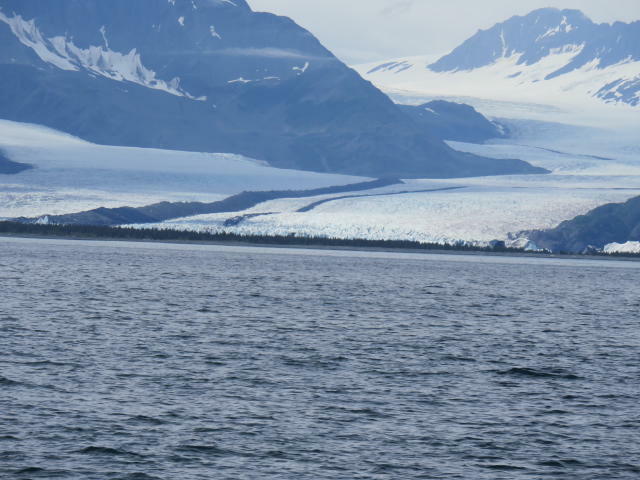 So the ultimate question is: "Why is the park named Kenai Fjord National Park?” As it turns out the fjord forms as the ground up rock, silt and soil move ahead of the icy glacier. When all that debris is deposited into the ocean, it forms a natural barrier (a moraine) between the glacier ice and the ocean. 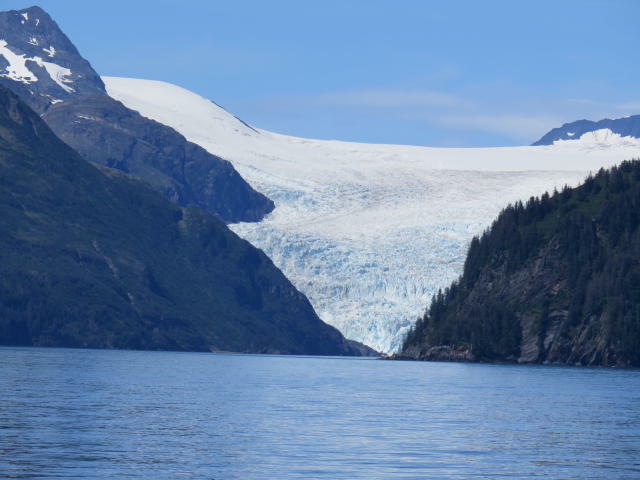 This leaves the glacier in a fjord, a long narrow deep inlet between high cliffs. As the ocean tides and waves work away on the natural moraine barrier, it eventually breaks and the ocean meets the glacier. The moraine recedes to just under the ocean surface. 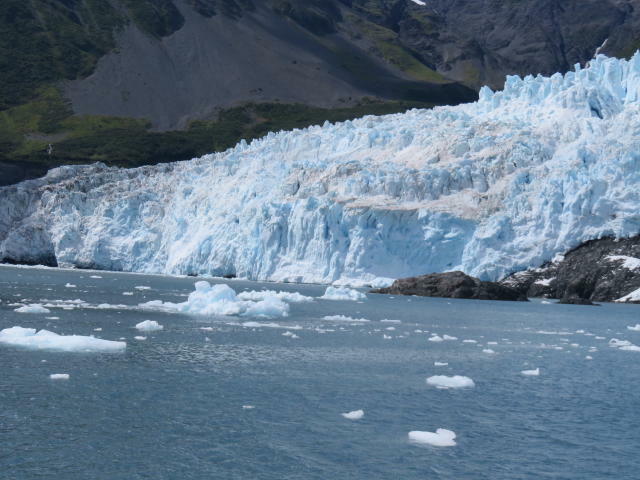 The glacier becomes an estuary just like a creek or river meeting the lake or ocean in other locations. This barrier is quite close to the surface. We noticed on overhead screens showing our course and various parameters of the trip, that as we approached the Aialik Glacier (its barrier is submerged) the depth finder went from in the area of 215m (700 feet) of depth to 7.6m (25 feet) and then back up to 215m (700 feet), in a very short distance on our course. Eric pointed out this phenomenon as we passed another submerged moraine on our course back home. The last Slide (#10) shows a moraine in front of a glacier. 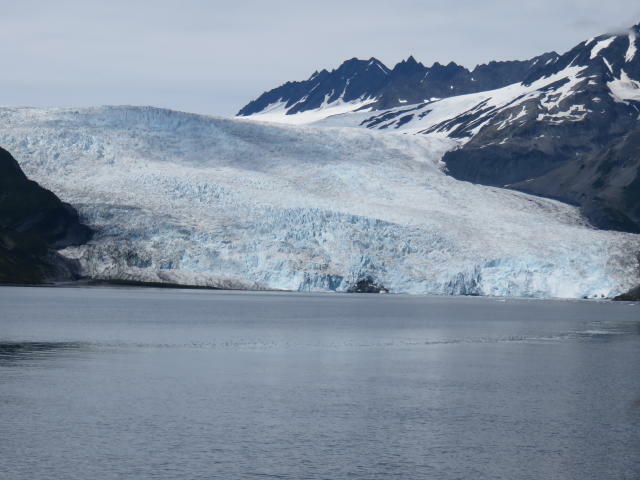 It is that narrow band between the water and the glacier that is rock covered at the ocean surface and then there is foliage farther up and behind, growing in the rich soil that the glacier deposited. Eventually the ocean will breach that barrier moraine as well. In our next message we’ll cover some of the birds we saw on our tour.